This is a work in progress. It will continue to be edited and updated as needed. This dictionary is an attempt to create a standardized vocabulary for use when discussing contemporary competitive jousting. It is based not only on historical sources(which can vary greatly depending on time and place), but also on modern websites that deal with jousting, and discussions held between jousters/crew on social networking sites and at tournaments. If you have suggestions for words/phrases to add to the dictionary, changes to existing definitions and/or other ways to improve this page, please email The Jousting Life. If you have a question about a word/phrase(either on this list or not), feel free to email TJL and ask about it. Arçon: a traditional French word for the front part of a saddle, in English it's generally called the 'Pommel'. Armour: the protective clothing worn by the jouster and sometimes the horse during jousting. It is usually metal, but occasionally leather or other materials are used depending on the type of jousting being done. Arret and Grapper: The 'Arret' is a sort of hook attached to the breastplate of jousting armour for the base of the lance to rest upon. 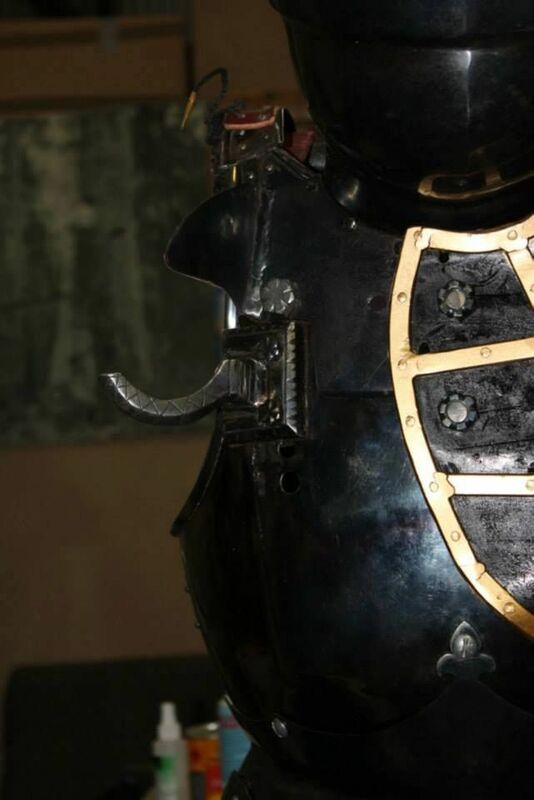 (Some breastplates include an arret and some do not.) The 'Grapper' is a sort of tight ring attached to the base of the lance just in front of where the lance rests upon the arret. 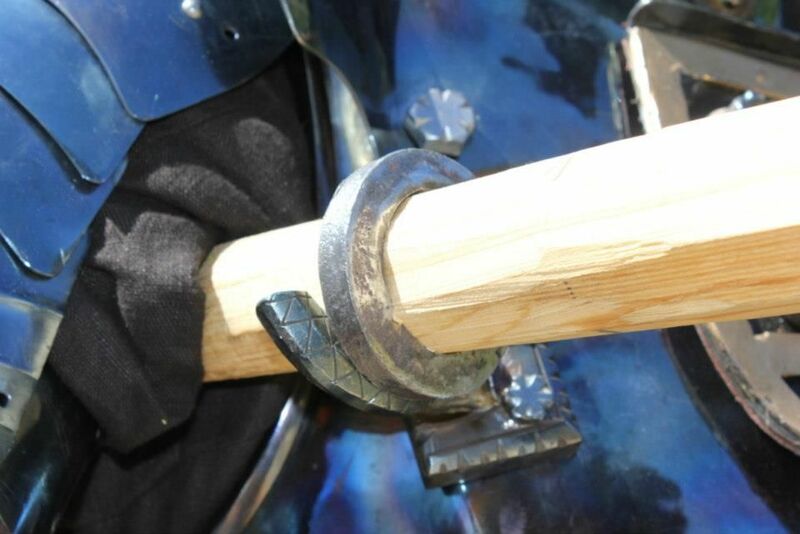 The arret and grapper work together to hold the lance in place and prevent it from sliding backward in the jouster's grip during impact. They may or may not also increase the force of the hit. Firstly, because the force of the oncoming opponent against the side of the lance frequently causes the jouster to lose control of the lance, and any loss of control of the lance is dangerous. Secondly, because the lance was NOT broken by accurately striking the TIP of the lance against the opponent's shield or upper body, but rather by hitting the opponent with the side of the lance. Caparison: the fancy cloth or strapping(Strap Caparison) that covers the horse during tournaments. It usually displays the jouster's colors and sometimes their coat of arms. It is not designed to provide protection; it simply helps to identify the jousters and adds to the pageantry of the joust. 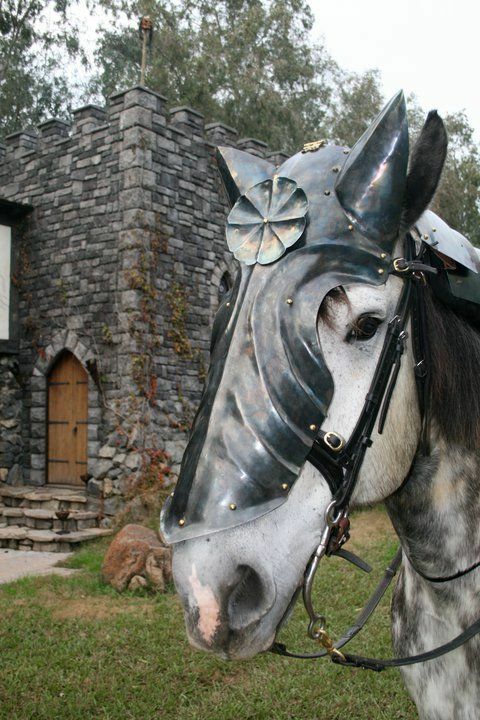 Chamfron: armour for protecting the horse's face. It can be made out of leather or metal. The word has been spelled in a variety of ways in different times and places. 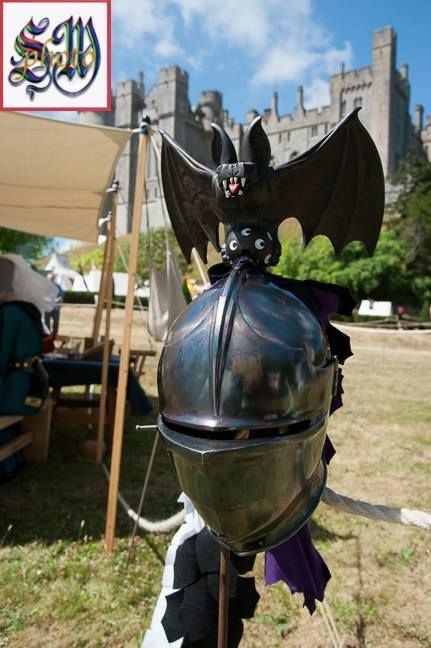 Two of the other popular spellings are 'shaffron' and 'chanfron'. Chivalric Martial Arts: a modern phrase that refers specifically to the kinds of 'Equestrian Martial Arts' used during the 12th through 16th centuries in Europe. A specific category within the broader category of 'Historical Mounted Martial Arts'. Coronel: the shaped cap(frequently, but not exclusively, crown shaped) that is placed on the very tip of the lance. 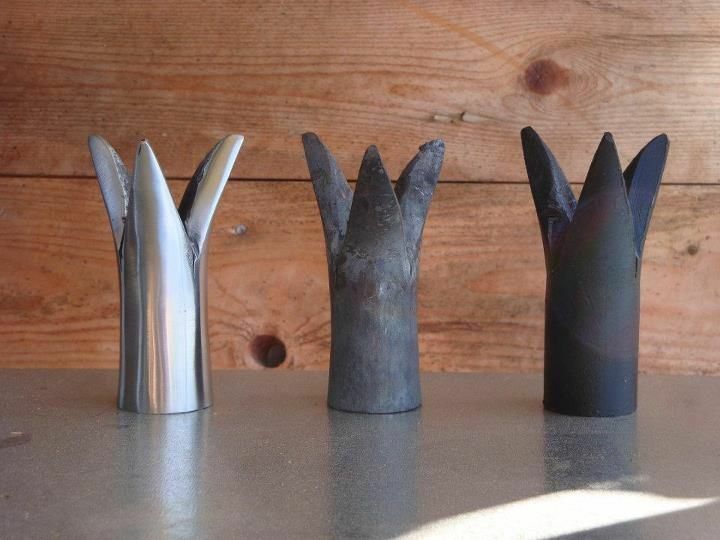 Coronels can come in a variety of shapes and materials. Crest: a decorative item placed on the top of a jouster's 'Helm'. It usually reflects the jouster's 'Heraldry' in some way. It can be a few feathers in the jouster's colors, an elaborate sculptural piece that depicts some aspect of the jouster's coat of arms or anything in between. Ecranche: a small wooden jousting shield which is usually strapped onto a jouster's left shoulder, though sometimes it is bolted in place. 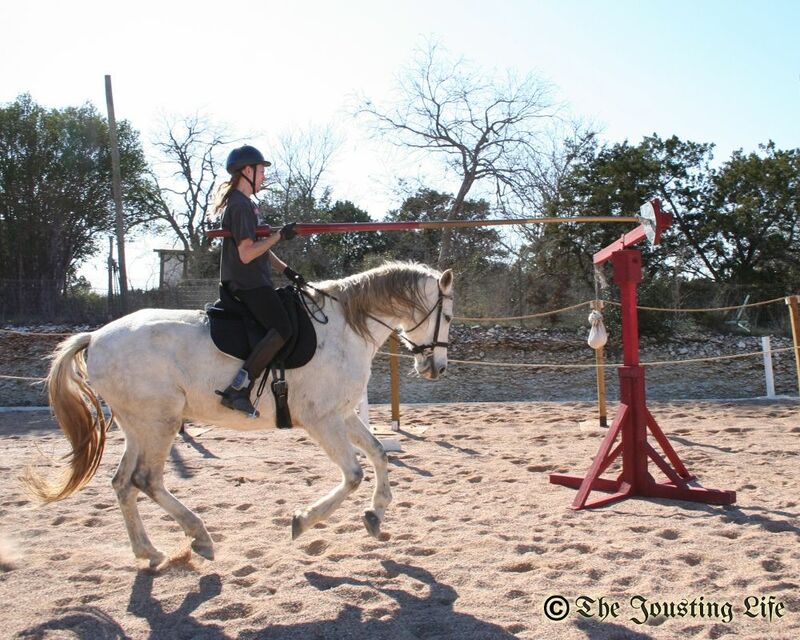 Ecranches were a common jousting target used from the late 14th century to the early 16th century. 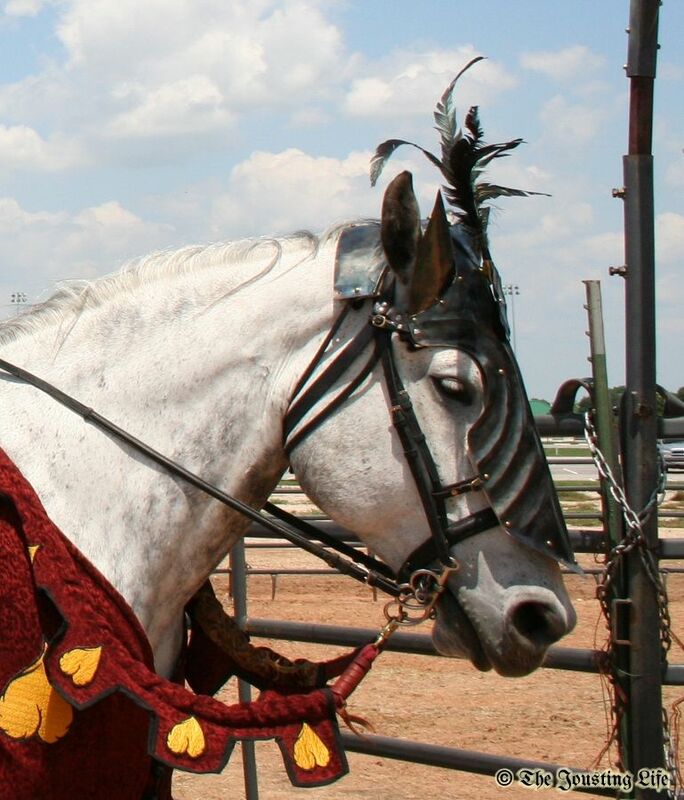 Modern ecranches are usually painted with the jouster's 'Heraldry'. 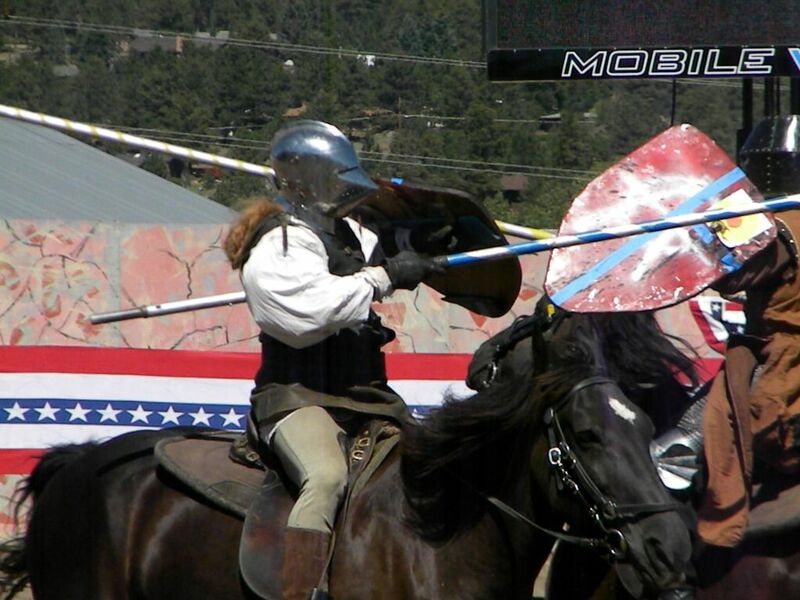 Failure to Present: In jousting, unlike most other combat-based sports, there is NO defense. A jouster cannot block or dodge the opponent's lance during a pass. Instead the jouster must present themselves and their shield(ecranche, grand guard or heater) directly towards their opponent. If a jouster does not present themselves and their shield directly towards their opponent, it is called Failure to Present, and the jouster may receive a warning(for a first offense), be penalized in some way or even be disqualified from the competition altogether. Ferrule: the metal tube used to connect the replaceable tip of a 'Frangible Lance' to the base of the lance. 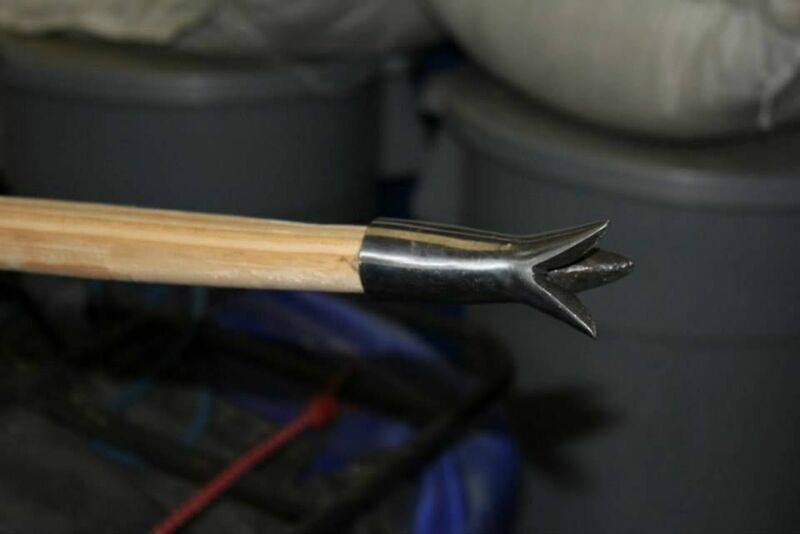 Ferrule Strike: a lance hit so powerful that the entire replaceable tip of a 'Frangible Lance' is broken away, and the 'Ferrule' itself strikes solidly against the target. 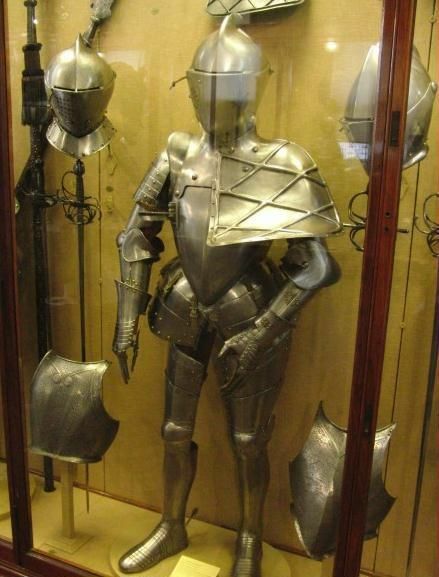 Garniture: a more accurate term for a complete set of armour, one which includes additional pieces that can be added on or switched out when the armour is used for different purposes, such as ground combat, mounted combat or the joust. 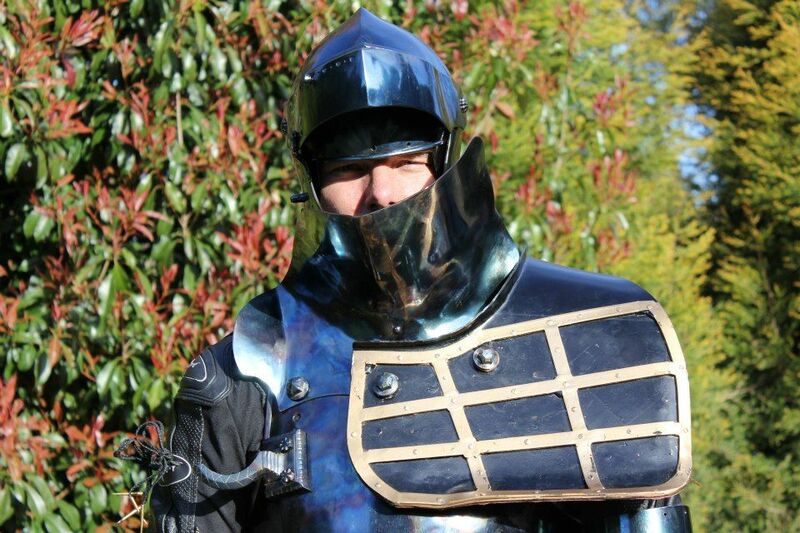 Grand Guard or Gridded Grand Guard: a small metal jousting shield that is bolted onto the jouster's left shoulder. It may be smooth or have a series of raised grids. Grand guards were a common style of jousting target used in the mid to late 16th century. 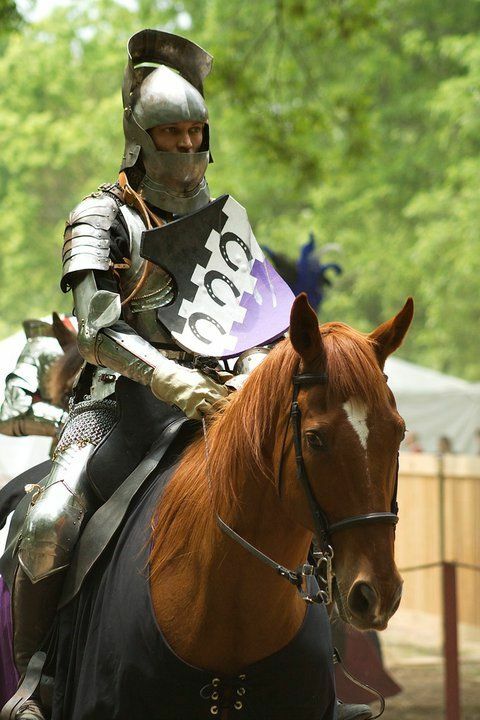 Groom: the member of the ground crew responsible for the care of the jouster's horse during the tournament. Ground Crew: the absolutely essential personnel who organize and run the jousting tournament, set up and take down the 'Tilt' and other equipment, assist the jousters during the tournament, remove broken lance pieces from the 'Tilt Yard', and who generally make sure that everything that needs to be done actually gets done. See also 'Knight Marshal', 'Lady of Honour', 'Lance Handler', 'Lance Prepper', 'Runner', 'Scoring Judges' and 'Squires'. Heater: a fairly large metal shield that is held in the left hand or strapped to the left arm during certain styles of jousting. Helm: a piece of armour designed specifically to protect the head. There are many different styles of helms that can be worn for different types of combat. Heraldry: the colors and symbols used to identify jousters. 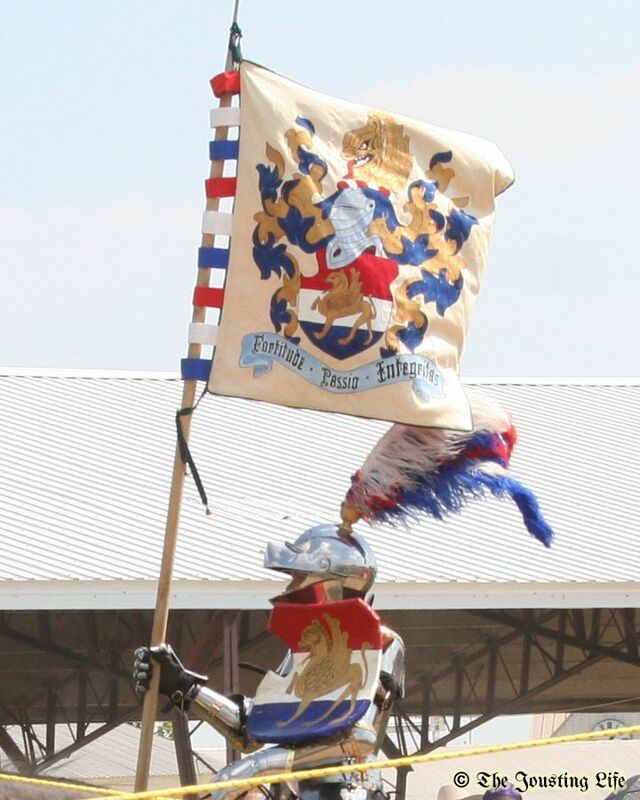 A contemporary jouster's 'Ecranche' is frequently painted with their heraldry. Historical Equestrian Sports: A phrase used to refer to a variety of equestrian activities practiced in the present time, but designed to reproduce combat, hunting or sporting skills performed on horseback during various periods of history. Historical Mounted Martial Arts: A phrase used to refer to a variety of 'Equestrian Martial Arts' practiced in the present time, but designed to reproduce combat skills performed on horseback during various periods of history. The word "mounted" is used instead of "equestrian" so that when abbreviated, HMMA is not confused with the abbreviation for 'Historical European Martial Arts' (HEMA). Horse Master: the person in charge over all of the grooms as well being ultimately responsible for the care and well-being of all the horses involved in the tournament. International Jouster: a jouster who has competed in multiple countries. Joust at Large: a joust done without a tilt. See also 'tilt and counter tilt'. 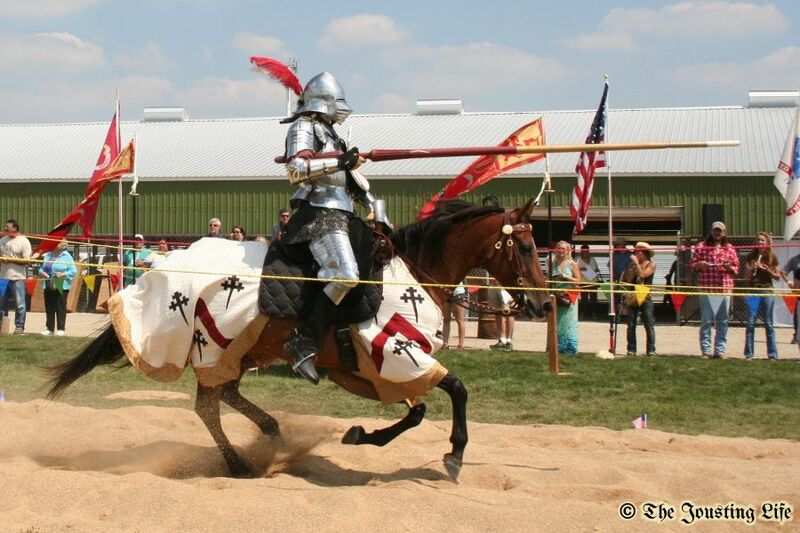 Jouster: a person who participates in the equestrian sport of jousting. Usually a jouster will be assisted during a tournament by one or more members of the ground crew, such as a valet and/or a groom. Jousting Shield: any of several different kinds of shields used for jousting in various times and places. See 'Ecranche', 'Grand Guard' and 'Heater'. Knight Marshal: the main referee for the jousting tournament. Also called 'King/Queen of Arms' or 'Marshal of the Field'. Ladies Court: a type of 'Court of Honour' made up of knowledgeable people, usually female, who are in charge of judging the chivalry and horsemanship of all participants in the joust. In some tournaments, they have the ability to give extra points to those competitors who show higher levels of equestrian ability and/or chivalry. There may or may not be a 'Lady of Honour' who acts as the leader of the Ladies Court. See also 'Court of Honour'. Lady/Lord of Honour: the person in charge of judging the chivalry and horsemanship of all participants. She makes sure that everyone behaves with good sportsmanship and handles their horses with both competence and kindness. Her duties and amount of authority may vary from tournament to tournament, and some tournaments do not have a Lady/Lord of Honour. If there is a 'Court of Honour' or a 'Ladies Court', then she is the leader of the court. Lance Handlers: members of the Ground Crew who hand the lance up to the jouster at the beginning of a jousting pass and receive the lance from the jouster at the end of the jousting pass. See also 'Ground Crew'. Lance Preppers: members of the Ground Crew who prepare the lances to be used during a jousting pass. When Frangible Lances are used, this may involve removing broken tips from the re-usable base and replacing them with new tips. If Solid Lances are used, this may involve removing the re-usable parts(Coronels, Vamplates, Grappers, etc...) from the broken lances and adding them to new lances. See also 'Ground Crew'. Levée: the slow graceful lowering of the lance, perfectly timed to meet your opponent's shield as you pass the center of the tilt. After engaging your opponent, with your lance broken or not, you proceed to just as elegantly raise it so that it is in an upright position when you reach the end of the tilt. Line Judges: referees that help the 'Knight Marshal' with scoring and making sure that all the safety regulations are followed. Also called 'Sergeant Marshals'. See also 'Ground Crew'. List Field or Lists: the arena or designated area where the jousting tournament takes place. The List Field includes not just the 'Tilt Yard', but also the areas for 'Mounted Melee', 'Mounted Skill at Arms' and/or any other activity included in the tournament. Match: a series of 'Passes' between the same two jousters done consecutively with minimal or no break between passes. A series of 'Matches' done one after the other with minimal time between them is a 'Session'. Mercy Pass: A jouster experiencing significant difficulty after the jousting 'Pass' has started, but before the two jousters have met, may deliberately swing their lance far off target as an indication that they are asking for mercy (i.e. not to be hit). If the opposing jouster sees that the first jouster has asked for a 'Mercy Pass', they are expected to pull their lance off target as well. HOWEVER, due to the extremely limited visibility through a jousting helm, the opposing jouster cannot always see that the first jouster has asked for a mercy pass. Therefore it is understood that asking for a mercy pass does not always mean that you will receive it. Mounted Duel: any of a variety of forms of mounted combat between two (and only two) competitors performed as a sporting competition. A mounted duel is frequently done using swords, but can also be done using other weapons or no weapons at all(mounted grappling). 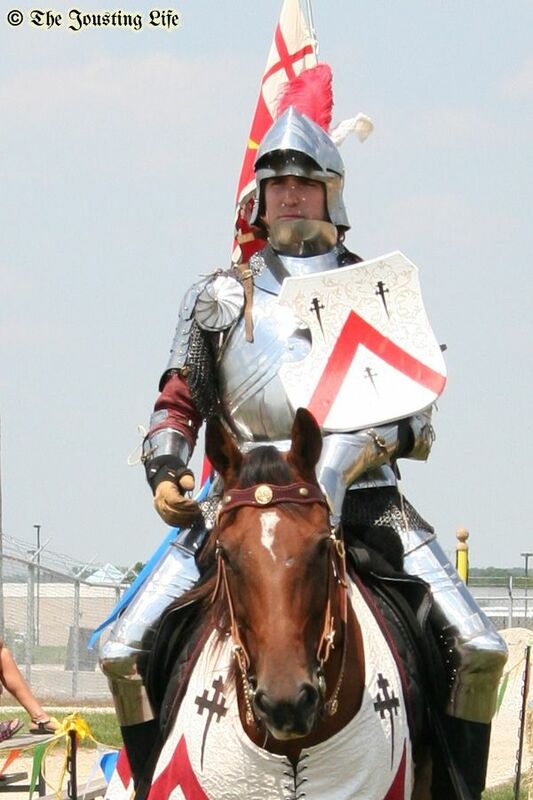 Mounted Valet: a member of the ground crew that remains mounted on a horse in order to be better able to assist in various ways, including quickly carrying broken lances to the Knight Marshall for him/her to evaluate and running lances from one end of the tiltyard to the other as needed. Their mounts can also be very useful in keeping the jousting horses company between passes and in helping to guide the jousting horses into the tilt. Pass: the single instance of two jousters cantering the length of the tilt while carrying lances and attempting to strike one another. A consecutive series of passes between the same two jousters makes a 'Match'. Quintain: A 'Quintain' is an apparatus with a small shield or target set at approximately the height to represent an opposing jouster's shield. The target is on one end of a spinning plank that has a weighted bag on the other end. The quintain is used to practice aiming the tip of the lance at a small target that provides a small amount of resistance. See also 'Shock Quintain'. Runners: members of the ground crew who collect the broken pieces of lance between each jousting pass. They also gather any re-usable equipment(such as 'Coronels') and return them to the Lance Preppers. See also 'Ground Crew'. Scoring Judges: referees that help the 'Knight Marshal' with scoring and making sure that all the safety rules are followed. Also called 'Sergeant Marshals'. See also 'Ground Crew'. Session: A series of jousting 'Matches', 'Mounted Melees' and/or 'Mounted Skill at Arms' runs done one after the other with minimal time between them. There are usually several 'Sessions' of competition, sometimes over two or more days, within a tournament. Sergeant Marshals: referees that help the 'Knight Marshal' with scoring and making sure that all the safety rules are followed. Also called 'Line Judges' or 'Scoring Judges'. See also 'Ground Crew'. Shock Quintain: A 'Shock Quintain' is a shield or target that is heavily weighted or attached to the ground with springs in such a way that it is very difficult to knock over. Shock quintains can vary a great deal in design. They are used to train both rider and horse to withstand the shock of hitting the opposing rider with their lance. See also 'Quintain'. 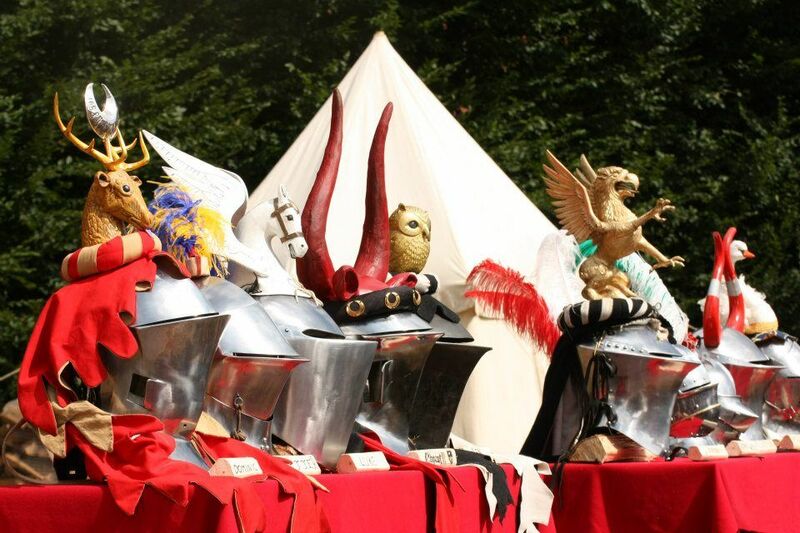 Soft kit: the historical clothing that a jouster wears when not wearing armour. Targe: a word that commonly refers to a round hand held shield used in ground combat, particularly by the Scottish Highlanders. It can also be used to refer to the shoulder shield that is targeted in jousting. See also 'Ecranche' and 'Grand Guard'. Tenan and Venan: The 'Tenan' is the jouster considered to be defending the field in a series of jousting passes. 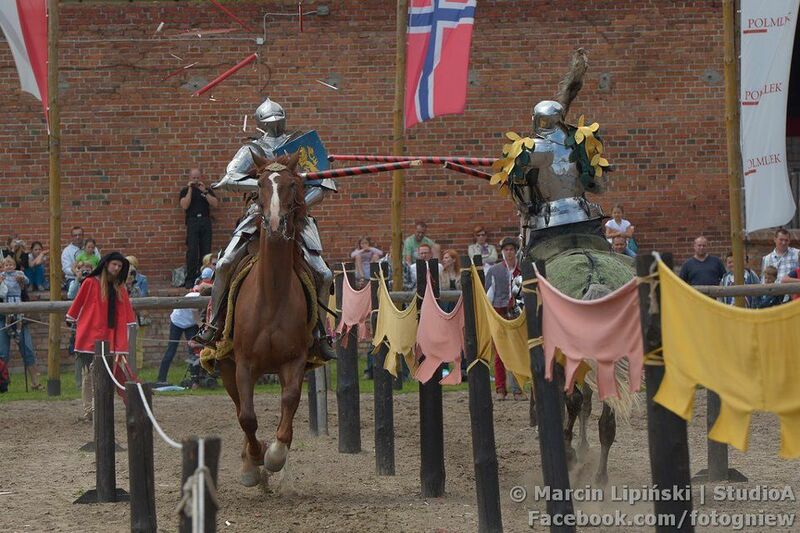 The 'Venan' is the jouster considered to be challenging the defender of the field in a series of jousting passes. Not all tournaments are designed to incorporate the concept of tenans and venans. Tilt and Counter Tilt: The 'Tilt' is the barrier between the two opposing jousters. It can be a solid fence, a wooden rail, a length of fabric or even a simple rope. The 'Counter Tilt' is another barrier, usually shorter in height than the Tilt, that defines the outside edge of the lane down which the jousters will canter. It can be a wooden rail, a length of fabric or a simple rope. Not every 'Tilt Yard' includes a 'Counter Tilt'. Valet: the member of the ground crew responsible for the care of the jouster and his/her personal equipment(armour, shield, weapons, etc...) during the tournament. 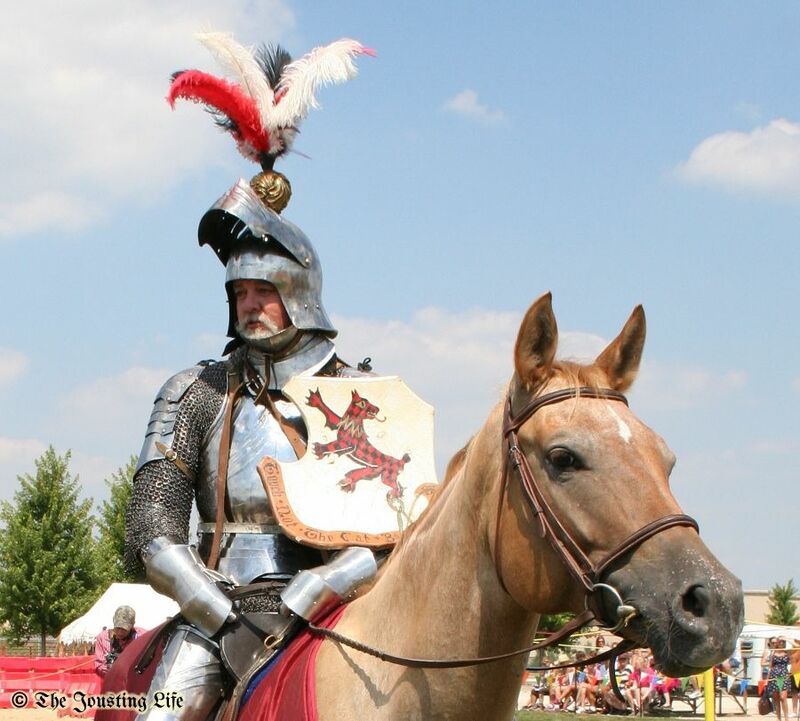 The valet will help carry the jouster's helm, shield and other personal equipment onto and off of the list field, and will help the jouster put on, take off or adjust his/her armour. The valet may or may not also be responsible for handing the jouster the lance before a jousting pass (see also Lance Handler). They may also help out with other ground crewing work. The valet basically fulfills the function of the historical squire to the historical knight, but because the term 'squire'(short for esquire) can actually refer to a specific rank or title(as the term 'knight' more obviously does), the modern term 'valet' is used instead. 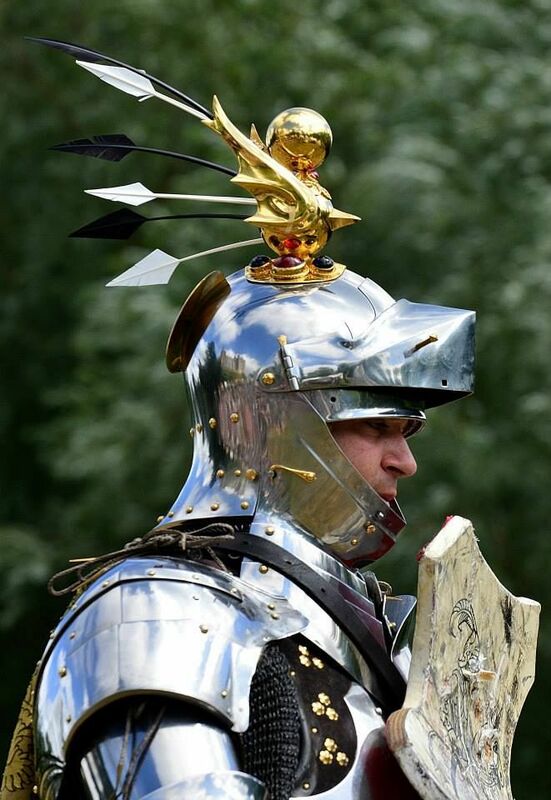 Vamplate: the flared round metal “shield” that sits on the base of the lance just in front of the jouster's hand. Some lances include vamplates and some do not. Interesting and informative. 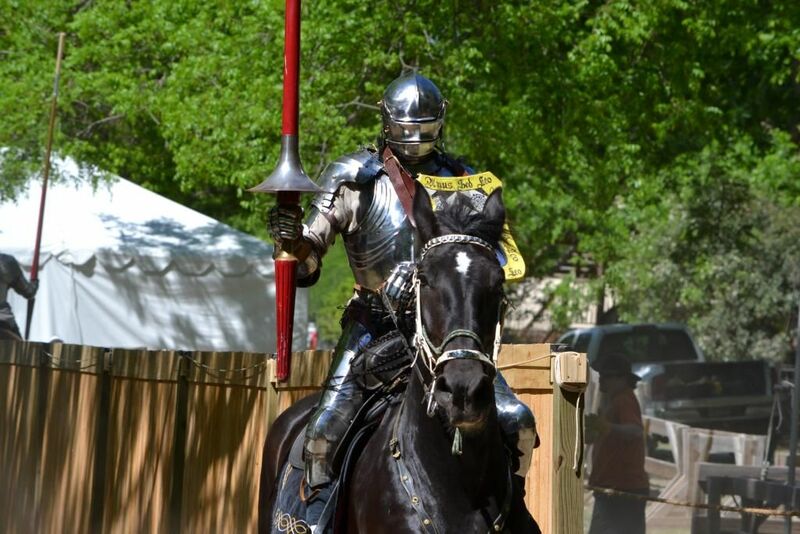 I am currently writing a short story about a knight, and a jousting tournament is included in the storyline, so this article has provided me with some useful information. Thank you. Tips on Buying a replica here uk replica watchesPeople spend a lot of time scouring the Internet for replica watches uk replica omega watches,buy a good piece is that easy. There are many sell replicas watches of famous designer brands we can be sure about its high quality and looks.